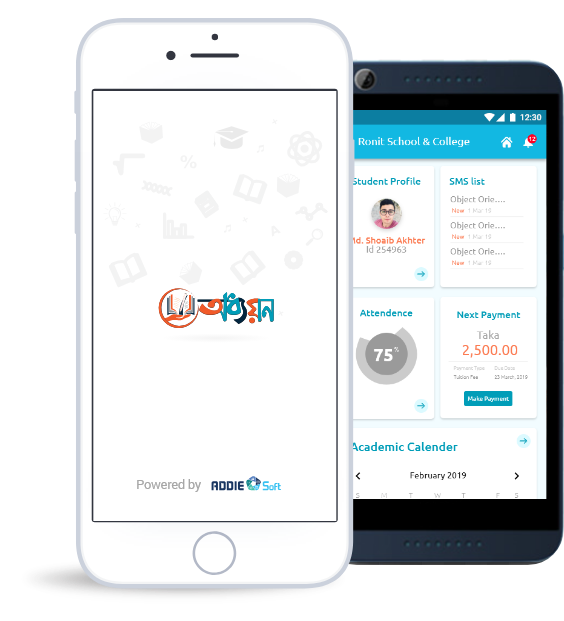 Creates a common gateway of data and services for each student including information for admissions, ID Card, Sibling data, Student Promotion, while also simplifying Bulk Import/Export. Manages daily/period-wise student attendance, by tracing students and sending auto alerts to parents of absent students & reporting using Attendance module of ODHYYON ERP which is easy and time saving. Manage Assessment and Result, Subject, Sub Subject, Marks. Customize latest Pattern and other all Boards. An excellent built-in A/C system to manage several departments by creating account heads, insert transaction, view day wise or monthly ledger, income expense report, view balance sheet, generate reports etc. When students absent in class, miss period, absconding or even pay fees/dues, the system will send SMS to their notification number regarding the specific motives. Reports regarding student record, Fees, Exam, Attendance, Performance, academics reports is available in our School Software. A system to manage employees of multiple departments by managing leaves, attendance, absent and reports. Automated attendance & assignments, Class routine. Effortless exam & result management. Track student performance history with different view. Enhanced interaction with teachers, parent. Get all updates even during absence through Web or apps. Welcome to the extremely Dynamic, Productive, Significant, Flexible, Efficient , Unified, Simple and SECURED yet user-friendly automated digital environment called Odhyyon, an ERP solution specifically tailored for the education industry. Education ERP is what institutions need today in this competitive world, as it enables them to optimize processes and analyse capabilities for reduced cost, improved speed and efficiency. Odhyyon provides a common platform for multiple functional departments that provides transparency in information flow. It keeps the management well informed and facilitate rapid decision-making. ADDIE Soft Ltd became the Champion in BASIS National ICT Award-2018 for it's one of the most popular and flagship product "ODHYYON Education ERP" in Business (Professional Service) Category. Thanks, specially to BASIS, our clients, team members, our community and of course the Almighty for staying with the company. ADDIE Soft Ltd. was certified for participating on Asia Pacific ICT Alliance Awards (APICTA) award- 2018 after being champion on National ICT award organized by BASIS. It is a great honor and the company is grateful for what they have achieved in 10 years of their journey. ADDIE Soft Ltd. was awarded for participating on BASIS SOFT EXPO-2017 which was organized by BASIS. We thank BASIS and we are really grateful.